Looking for fun San Diego holiday events? Check out our list of festive events all around town and get ready to celebrate the holidays San Diego style! Snow Mountain 2018 – A chance to play in the snow in San Diego. Special appearance by Santa & his elves. Annual event hosted by the city of La Mesa. Join the city for holiday activities, traditions, craft booths, food & more! City of San Diego’s 41st annual free holiday festival. Entertainment, vendors selling handmade goods, food trucks & more! Join the Port of San Diego for the 47th annual San Diego Bay Parade of Lights, a holiday tradition brought to San Diego by the boating community! 4th annual gingerbread house decorating party, hosted by Queenstown Public House. Queenstown will provide a gingerbread house kit in exchange for a donated, unwrapped toy. Click the link above for comped entry! Enjoy the magical holiday season at The Grand! Holiday events include snow hill sledding, ferris wheel and carousel rides, s’mores, Moët & Chandon champagne garden, 25-foot Christmas tree, holiday shopping, & more! Christmas-themed pop-up cocktail bar serving holiday cocktails in a festive setting. Polite Provisions is the only San Diego location featuring the holiday pop-up at this point! 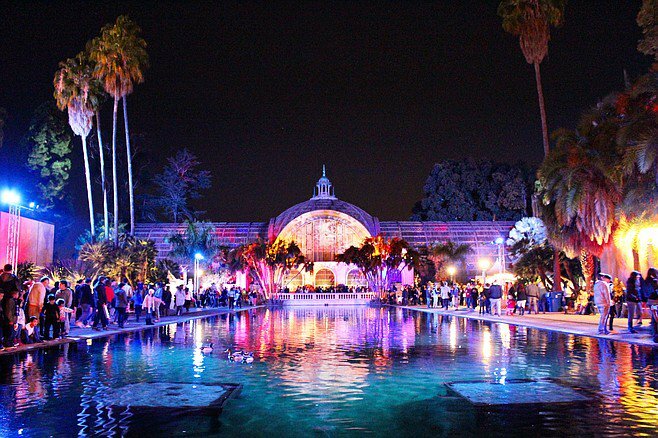 Visit the San Diego Botanic Gardens during this holiday season to see the garden light up at night with more than 125,000 sparkling lights.